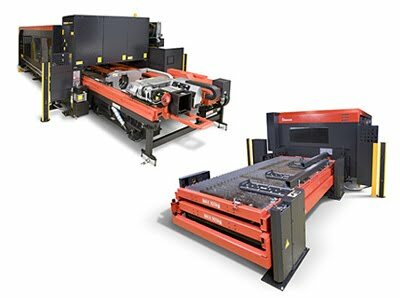 Our new Amada Laser Cutting System with Rotary Index (FOM2 3015 NT RI) is now up and running at EVS Metal’s ITAR-certified manufacturing facility in Keene, NH. This top-of-the-line integrated cutting unit is considered the most versatile rotary index system available. With its expanded process range, high-speed cutting head, outstanding accuracy and industry-leading stability, the Amada is a welcome addition to an already-impressive lineup of machines. Why did we choose this particular laser cutting system? In a word, precision. In particular, to achieve the exact and detailed cuts required for the large number of frames that are frequently requested by customers. Amada’s reputation for quality made the FOM2 3015 NT RI an easy choice and will allow operators to maintain the tight tolerances and quality standards for which EVS has come to be known, all in a single handling. What’s most interesting to note about this laser cutting machine is the technology behind it. The rotary index gives it the power and speed to accurately and efficiently cut even thick materials easily, including a significantly wider variety of tubing. Because the cutting head is placed close to the chuck, the dead zone is minimized, allowing even bowed pipe or tube to be easily and precisely cut from end to end without the use of vibration. The versatility offered by this Amada unit in particular means it is capable of processing almost any shape, from round or square to C-channel and angle iron, and when utilized in concert with the included Dr. Abe_Tube software, even fabricating complex tubular structures for welding is simplified. With this new addition up and running, EVS now stands ready to take on most any type of complex, high-precision cutting and machining project, from prototype to production run, efficiently and cost-effectively. Ready to discover how EVS Metal’s innovative fabrication systems can add value to your manufacturing supply chain? Simply request a quote online, or call us at (973) 839-4432 today.